"Gift" is a noun, "gifted" is an adjective, "give" is a verb. I'm on my usage high horse again. It isn't all that high. As I've said before, I'm not some fusty pedant who worries about split infinitives or ending sentences with prepositions. I usually don't object to the verbing of nouns; note that I just used the verb "to verb." I do have my pet peeves, but I like to think that I limit them to instances where error will cause confusion. The Wednesday ruling also required SUNY Downstate to account for the Othmer Endowment Fund by Sept. 20—a $130 million endowment gifted to LICH by the Othmer family. --Sarah Matheson, "Ambulance Services Restored at Brooklyn's LICH," Epoch Times, September 6, 2013 (emphasis added). The reason I've Italicized "gifted" in the quotation is that it's incorrectly used as a verb. It's an adjective that roughly means possessing greater than average intelligence or skill. The correct word in the context of the quoted sentence would be "given," the past participle of the verb "to give." Why do I care? 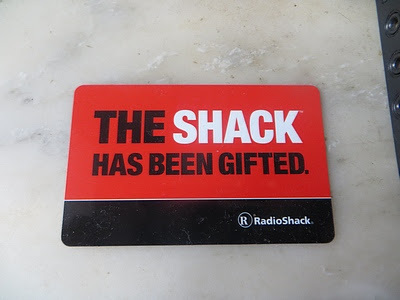 Because "gift" is a noun that doesn't need to be made into a verb, There's already a verb form, "give," that has no more letters than "gift," and therefore gives us no advantage in economy of expression. Consider, for example: "To verb a noun," thereby using the noun "verb" as a verb, has an advantage of brevity over "To make a noun into a verb." By contrast, "He gifted a book to his daughter" is longer, and clumsier, than "He gave a book to his daughter." Also, to use "gifted" as the past tense of "to gift" creates confusion with its use as an adjective. Would "a gifted child" mean a child blessed with talent, or one who was made available for adoption (not that they mightn't be the same)? Addendum: I should mention that "give" is sometimes used as a noun, in a way that doesn't bother me. It's used as a synonym for "flexibility," as in, "There's some give in it." It used to be. It's been dumbed down. I confess to having read very little of Seamus Heaney's poetry, just enticing snippets quoted here and there. They were enticing; Heany is one of those poets and other writers I have an ongoing resolution to read. I own a copy of his widely praised translation of Beowulf, which I've promised to read aloud to my wife and daughter over what will necessarily be a period of some weeks. I may even have been in the same room with Heaney without knowing who he was. One of my friends reported on Facebook that he was known to visit the Lion's Head when in New York. Besieged within the siege, whispering morse. If Heaney really is the best we can do, then the whole troubled, exploratory thrust of modern poetry has been a diversion from the right true way. Eliot and his contemporaries, Lowell and his, Plath and hers had it all wrong: to try to make clearings of sense and discipline and style in the untamed, unfenced darkness was to mistake morbidity for inspiration. That was her song, for she was the maker. Where kesh and loaning finger out to heather. This poem includes an artifact--the ash-fork--that is simply there, a "taker of the weather." It does not impose any order or scheme, it was simply, in Heaney's view, beautiful. The natural features--peat, kesh, loaning, and heather--have their own beauty, but the ash-fork is beautiful in their context. It could be beautiful in some other context, or none, as well. For the black plunge-line nightdress. So, what do I prefer: the "rage for order" or the savor of the particular? My answer is typical for me: I prefer neither, and like both. I've sometimes been accused of wanting to have my cake and eat it, too. My answer is, "Who wouldn't?" To me, the modernists and the particularists are like the Thatcher brothers in Peter Wheelwright's As It Is On Earth, epistemological yin and yang, forever connected and completing a whole. Seamus Heaney is laid to rest. 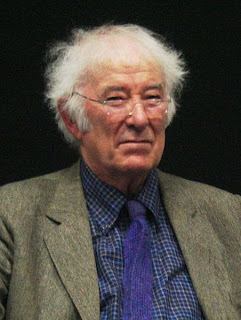 But, though the vessel lie empty, let the poetry live on, and on... .
Addendum: Christopher Benfey remembers Heaney as a teacher in this New York Review of Books piece. I was surprised and delighted when I walked into Key Food early this morning and heard this playing on the PA system. Some of my fellow shoppers appeared bemused when I started singing along.